The following seven individuals and two teams took their place in the showcase of Lorain’s top athletic talent, with their induction into the Lorain Sports Hall of Fame in ceremonies on May 7, 2015, at DeLuca’s Place in the Park. Plaques honoring each of the new inductees and teams will be displayed in the LSHOF Museum in the lobby of the St. Joseph Community Center in Lorain. The museum, free and public, is open from 10 a.m. to 1 p.m. on Mondays, Tuesdays and Thursdays, and evenings by appointment for groups. To learn more about the 2015 inductees’ achievements, just click on each of their names below. To see a video of the ceremonies, click here. Eddie Williamson of Lorain High School accepts the 2015 J. Ed Uland Award from the Lorain Sports Hall of Fame, honoring him as an outstanding scholar athlete in Lorain. The 2015 J. Ed Uland Award for outstanding scholar athletes in Lorain was presented to Eddie Williamson of Lorain High School. 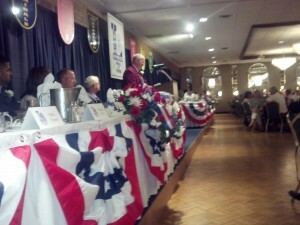 Bambi Dillon accepts the inaugural Leadership and Service Award presented by the Lorain Sports Hall of Fame. The award honors individuals who have made outstanding contributions of time and talent to support sports activities and other civic organizations in Lorain. Bambi Dillon , a Lorain native and a 1972 Lorain High School graduate, has been volunteering for 41 years in numerous roles with civic, school and sporting organizations, providing invaluable leadership. She is a past president of the Lorain Sports Hall of Fame as well.